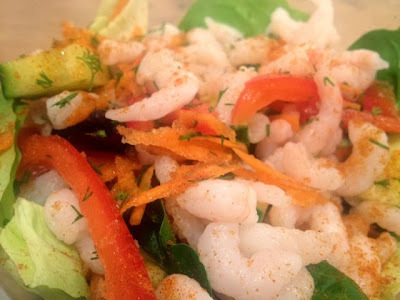 Cooked prawns are a brilliant ingredient for quick salads and lunches, a great source of protein and really good for you. 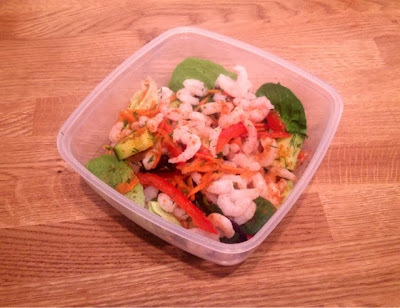 I’ve done a Sweet Chilli Prawn lunchbox on the blog before so I wanted to keep this one different. Rather than relying on a sauce for the main flavour, this time I’ve gone for very traditional salad ingredients and complimented the flavour of the prawns with herbs and spices instead. The fresh dill in particular I think really makes this dish, it lifts the whole thing and keeps it really fresh. and the paprika gives it a nice little kick. You could add a little mayo if this is a little dry for you.